How many of you caught our list of the Top 26 Coolest Wedding Venues in the US? The response to that feature was pret-ty overwhelming (in only the best of ways, of course! 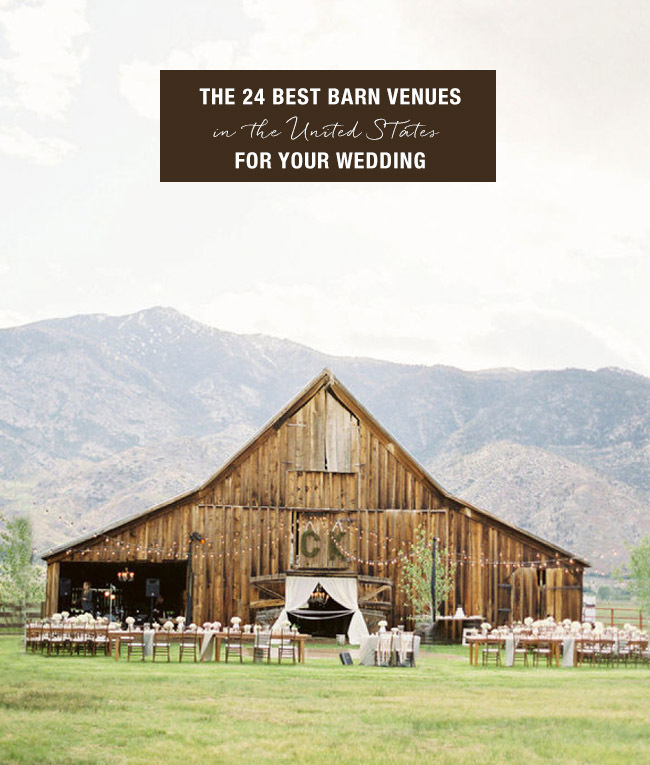 ), so we thought we’d drill in a little on this topic of venues and share our picks for the Top 24 US Barn Venues for your Wedding! The spots below each offer something incredibly unique and would make such a fun backdrop for a gorgeous barn wedding. 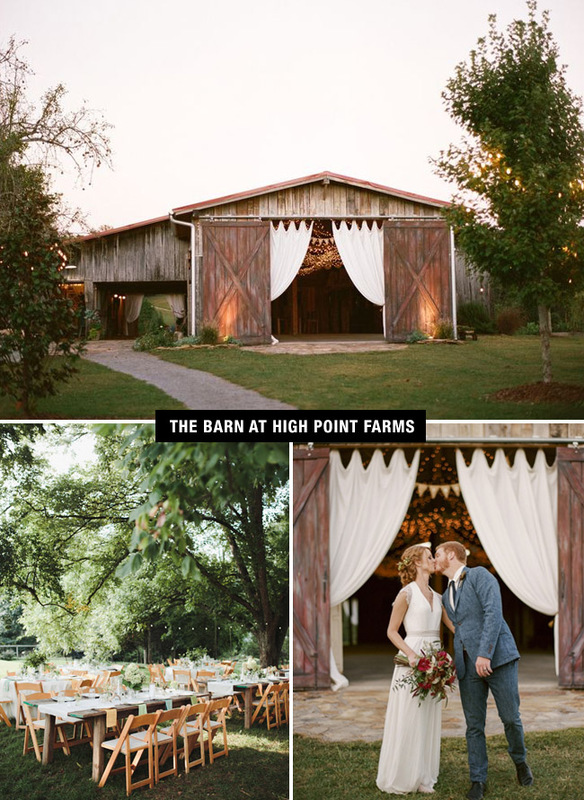 You’ll find barns with a laid-back California feel, those with a totally classic east coast vibe, and barns exuding a whole lotta southern charm! 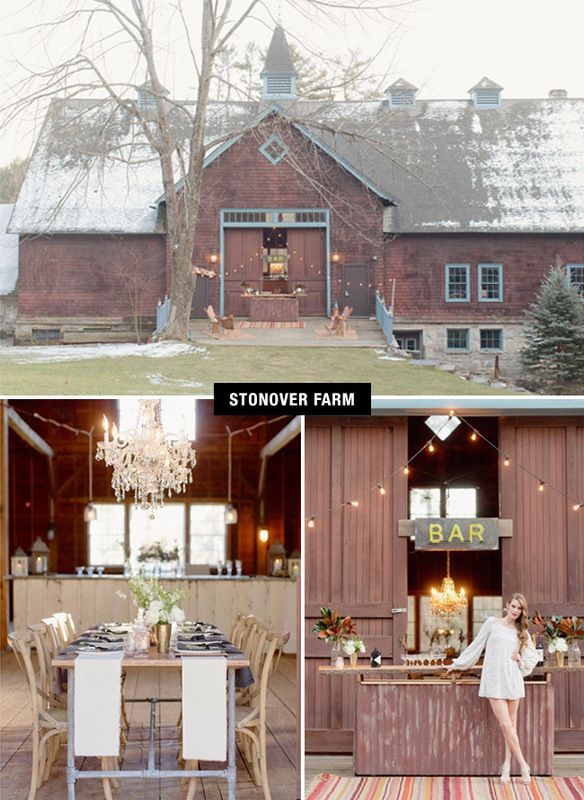 Don’t see your fave barn venue on our list? Leave a comment below and let’s get the barn banter happening in full effect! Oh, and that barn above? Unfortunately it’s on a private farm but we just adore the styling from it (the barn is captured perfectly by none other than Jose Villa! ), so thought we’d share to get your inspiration going! First up on our list is a longtime favorite of ours, Dos Pueblos Ranch in Santa Barbara. 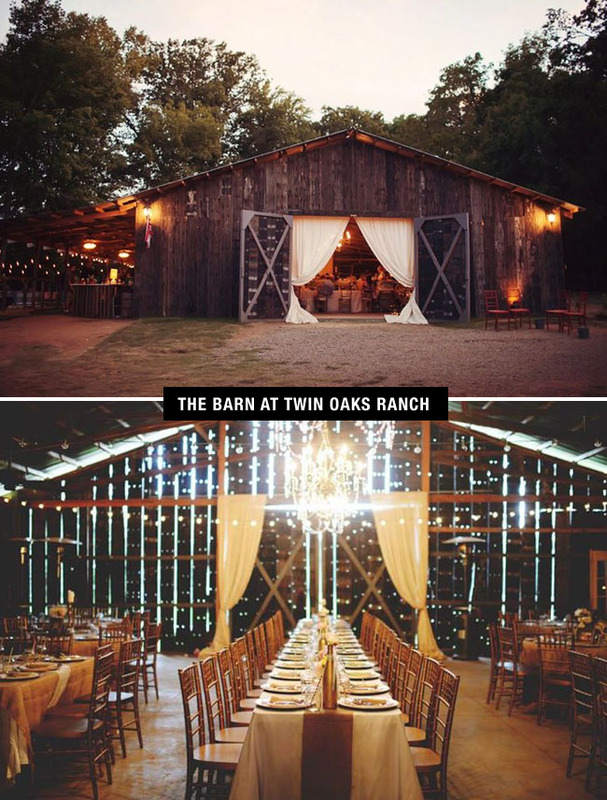 It takes the cake for its charming feel and we love the barn’s ability to perfectly transform to be as ideal a space for a rustic celebration as it is for an elegant and more formal affair. More brownie points for its proximately to the ocean! 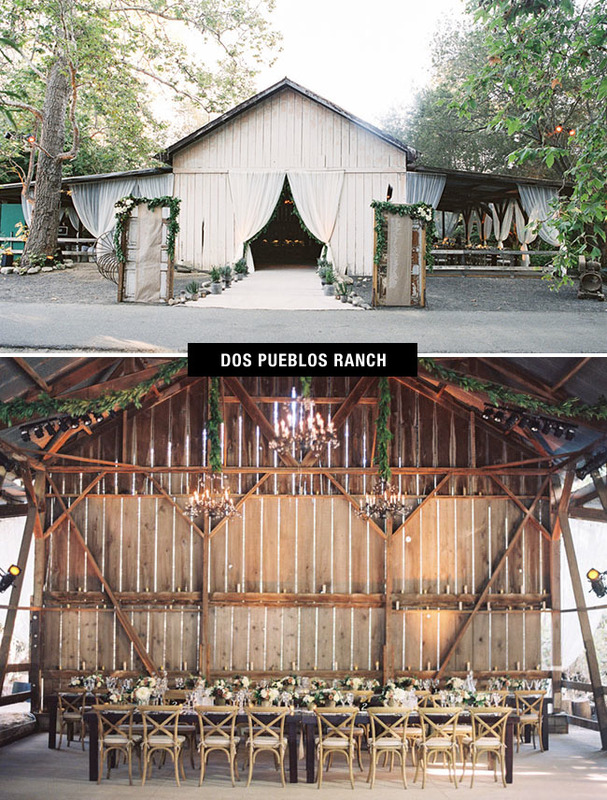 photos above thanks to Braedon Photography from this stunning DP Ranch wedding. Traveling a bit further up the coast, you’ll find the gorgeous (and fun!) barn and property at Santa Margarita Ranch. This historical setting offers exclusive amenities and the freedom to roam all over the ranch to capture the best photos on your big day! We’re also obsessed with the fact that a real railroad track loops around the ranch headquarters, offering wide-open views of the surrounding meadows and mountains. photos above thanks to Jake and Necia Photography and Onelove Photography. 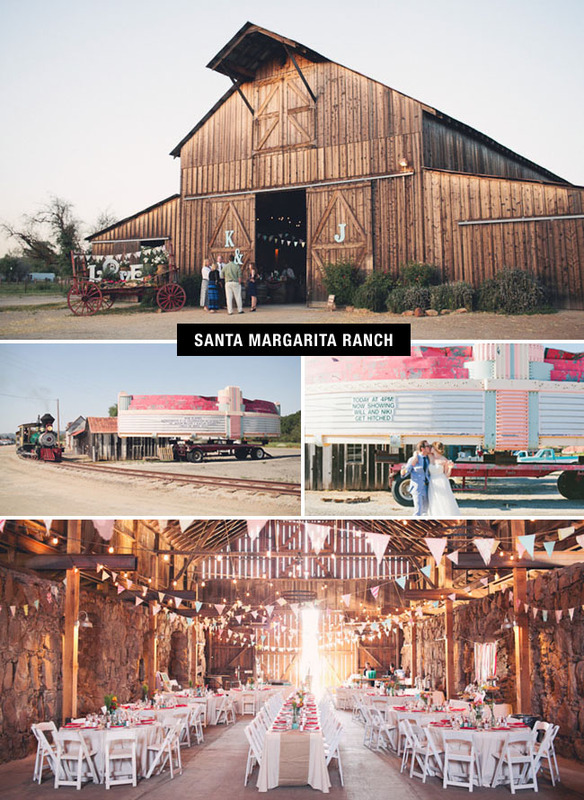 See more weddings from Santa Margarita Ranch here! 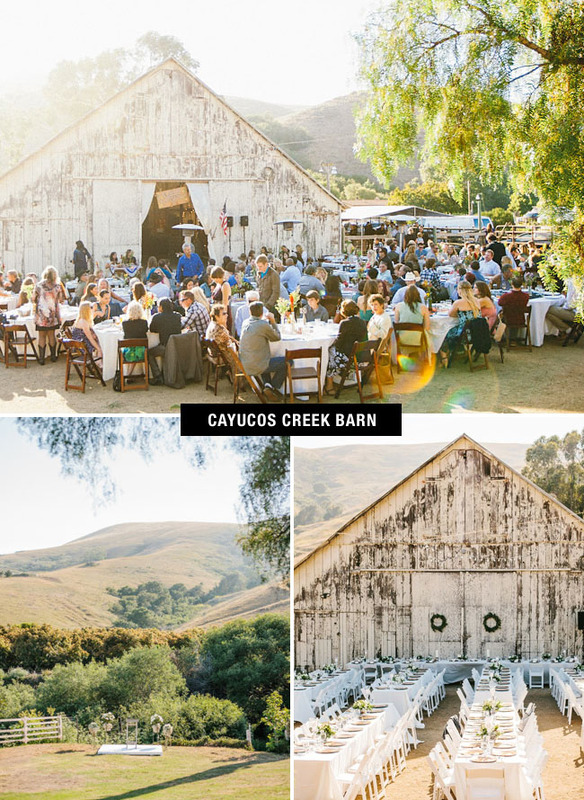 Described as ‘country coastal’, Cayucos Creek Barn is the perfect choice for couples wanting a day that’s relaxed with the perfect Cali vibe. Once a fully functional dairy barn, we love that it’s been preserved to its natural state without losing it’s beautiful, weathered charm. 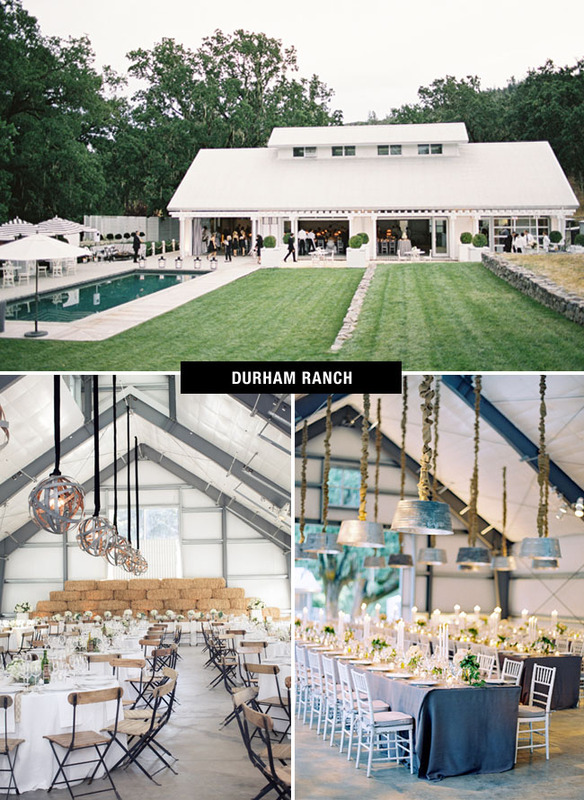 Durham Ranch, a former cattle ranch now surrounded by vineyards, makes our list for many reasons, but the top being its gorgeous, more modern feel. With 33 foot tall ceilings and steel + glass roll up doors that open to the pool and beyond, this barn would make for the ultimate celebration location! Not only will this pretty property charm the socks off of your guests, but nearby St. Helena is one of the loveliest sectors of wine country, ensuring a fun weekend away will be had by all! Nestled on 200 acres of stunning Washington farmland, the recently renovated and restored barn at Kelley Farm seriously defines the term rustic elegance. We LOVE that 300 hundred guests can fit comfortably within the barn’s historical walls for an unforgettable wedding. So perfect for a big guest list and an even bigger barnyard bash! What’s so great about The Barn at Evergreen Memorial Park is that it gives you both a quintessential Colorado vibe (hello, darling log-cabin architecture) with a touch of rural charm thrown in for good measure. Located in the foothills just west of Denver, this venue is as convenient as it is secluded. And there are views, views, views as far as the eye can see! 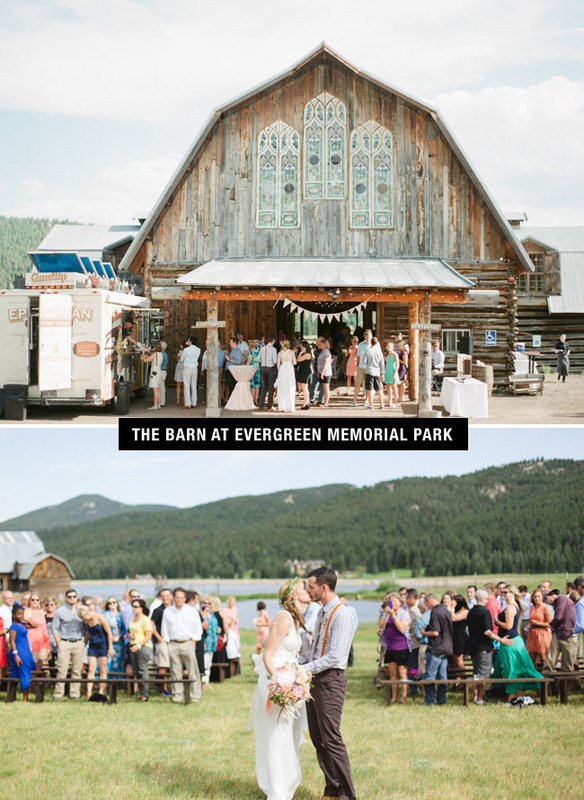 photos above thanks to Connie Dai Photography from this stunning barn wedding at Evergreen. 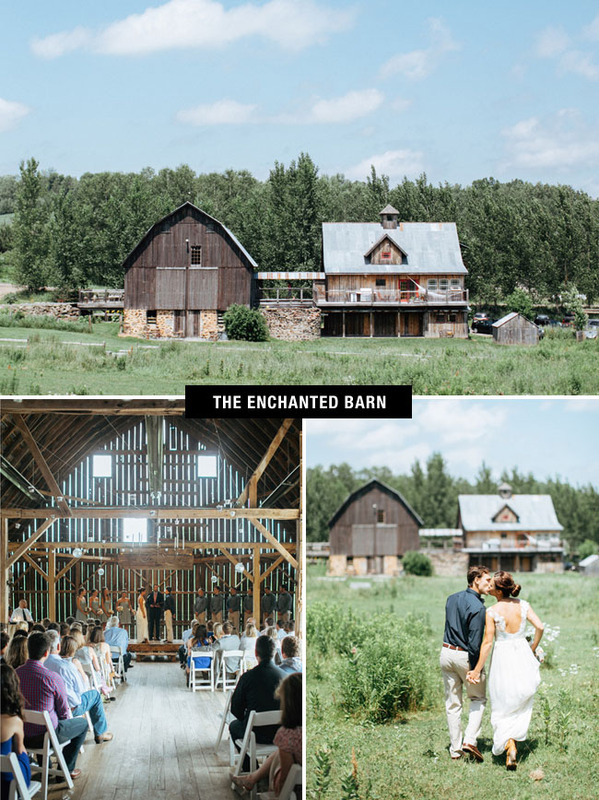 Our next barn venue is called The Enchanted Barn, and let us be the ones to tell you: it lives up to its name! It’s been selected three times by Martha Stewart Weddings as one of Wisconsin’s best and we adore its woodsy location + ultra-dreamy feel. Their website says it best, Imagine rays of sunlight filtering through cracks of weathered barn board. For Wisconsin couples, we think this space is tops. Tying the knot in Michigan, but have yet to find the perfect venue? 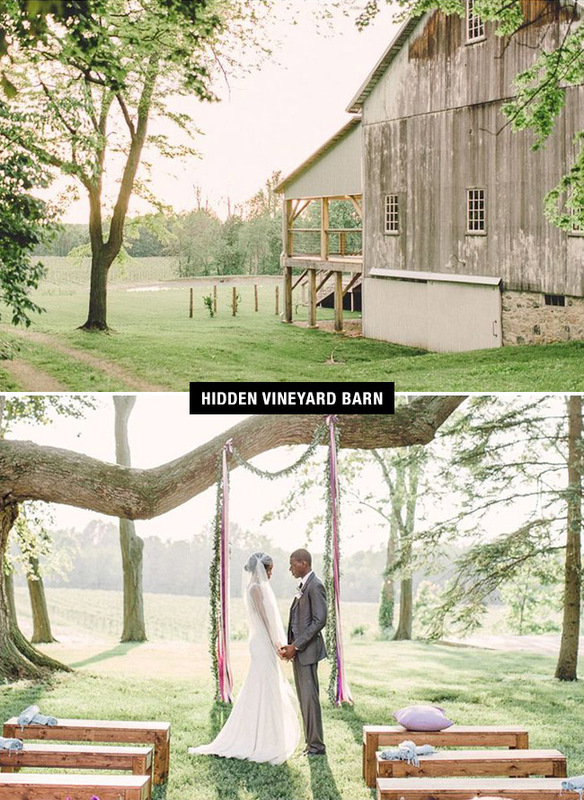 Hidden Vineyard Barn just might be exactly what you’ve been searching for! 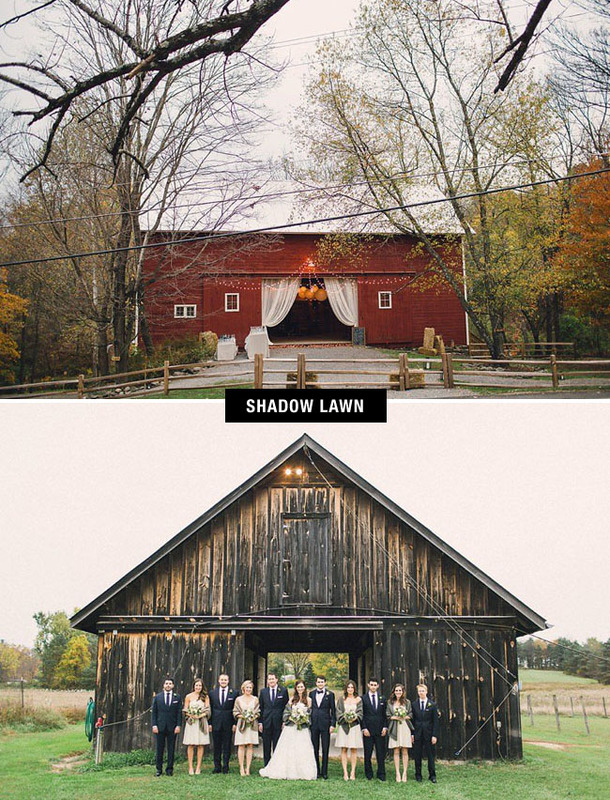 Situated on the grounds of a working farm in Southwestern Michigan, the barn’s scenic views, idyllic setting, and distinctive character have quickly launched the property to be one of area’s premier wedding locations. And with just a quick peek at the pretty this place has to offer, it’s not too difficult to see why! photos above thanks to Bradley James Photography and see a fun real wedding at HVB here! Since the owners of The Blue Dress Barn are both artist-designers, it’s no big surprise that this venue looks as perfect as it does! 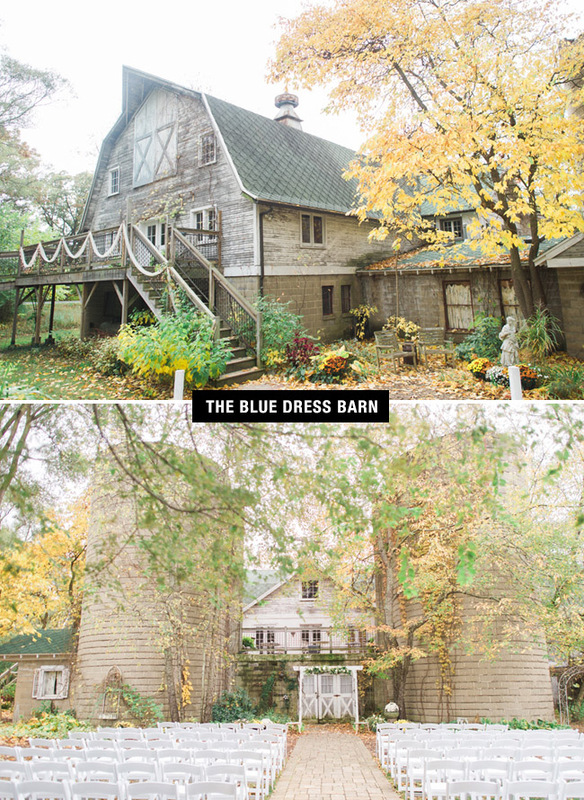 They’ve lovingly restored the historic dairy barn to feel both authentic and ideal for modern day weddings. With the ability to fit 280 guests under its vast, open-timber roof, we can’t think of a better place to host a fun + memorable Midwest celebration. photos above thanks to Kelly Sweet and see one of our fave real weddings, held at The Blue Dress Barn, here! We can all go ahead and be a little bit jealous of all the great barn options Texas couples have access to. 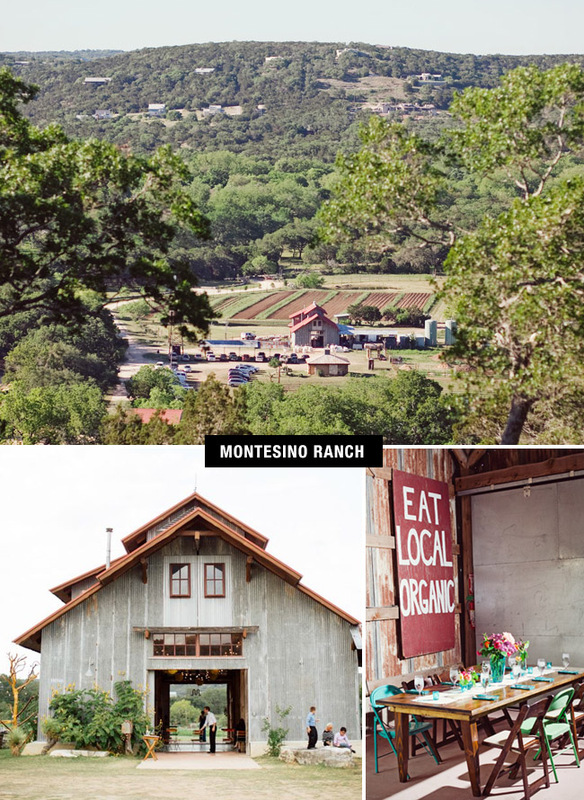 But with that said, Montesino Ranch has a way of standing out from the pack…hence why we’ve included it on our list of the best! With its distinctive blend of rustic ranch architecture situated in a pocket of serene Hill Country landscape, this place has played backdrop to some of our favorite weddings to date. We can’t wait to see how future couples will make this property their own + host their big day on the ranch with style. photos above thanks to The Nichols (top and bottom right) and Montesino Ranch and check out this real wedding to see even more! Stonover Farm looks like it’s straight out of storybook with its detailed, blue-trimmed hay-barn and lush, manicured grounds. As if the setting couldn’t sound sweeter, we’d like to point out the charming duck pond (! ), greenhouse + grand country inn (perfect for guest accommodations for the big day). Since they only host a few weddings each year, availability is extremely limited, only adding to this place’s appeal. If you’re getting hitched in Massachusetts in 2016, reach out soon to secure your date! Just check out that sunset shot above, and it should be clear why Moody Mountain Farm in New Hampshire should be considered one of the best in the US! They reserve only one wedding per weekend so you can begin setting up on Thursday afternoon + can tackle your clean up on Sunday morning! Flexibility can be worth its weight in gold (LOTS less stress + more time to make the property perfect) so if you’re thinking of tying the knot in New England, we think this place is worthy of a look! 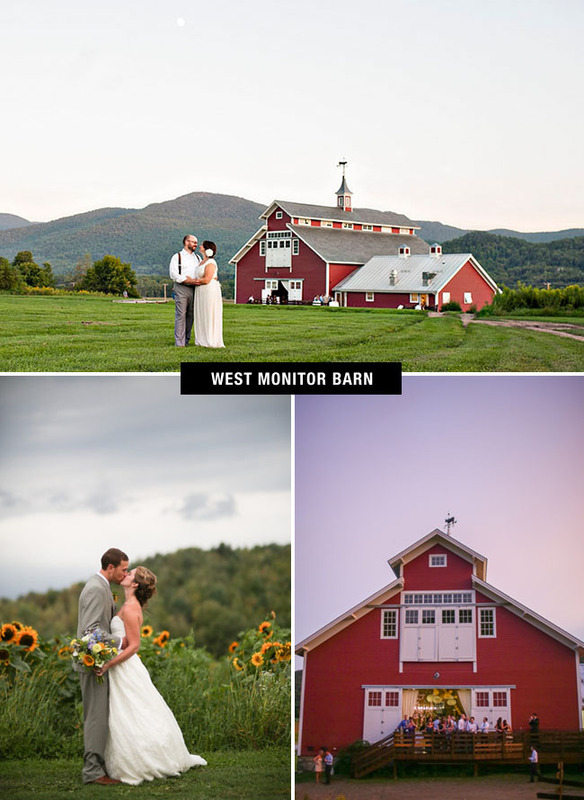 If a classic red barn is what you picture for your wedding, be sure to consider Vermont’s West Monitor Barn. With stunning views of forests, fields + woodlands hills as far as the eye can see, your guests will feel transported to a tranquil place while celebrating with you on your big day! Our absolute favorite reason to rent the WMB is that all proceeds from the venue rental go towards funding Vermont Youth Conservation Corps (VYCC) programs, which employ over 300 young people to work on high-priority conservation and education projects across the state of Vermont each year. Amazing, right?! 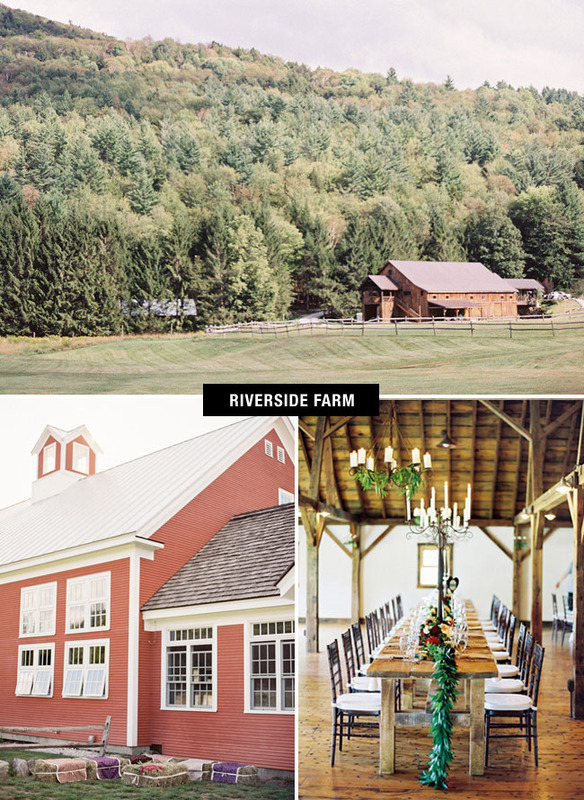 If you’re local to Vermont or thinking of planning a destination wedding there, look no further than Riverside Farm. Not only is the space stunning, but the exclusive amenities couldn’t be any better. Think farm-fresh food, lodging for your wedding guests, and fun activities available year round. Choose from several different barn + lodges for your festivities and get the full farm experience by exploring all this beautiful property has to offer. There’s just something about New York’s Hudson Valley that radiates tranquility and charisma. For all of you couples tying the knot in this region, we think you’ll want to add Shadow Lawn to your shortlist of venues to visit. Situated at the crest of the waterfalls in High Falls, New York, the setting couldn’t be lovelier or more ideal. The barn itself is a restored 19th-century structure which holds 120 guests – and we love that the property is available until midnight. photos above thanks to Lauren Fair Photography from this Hudson Valley barn wedding. 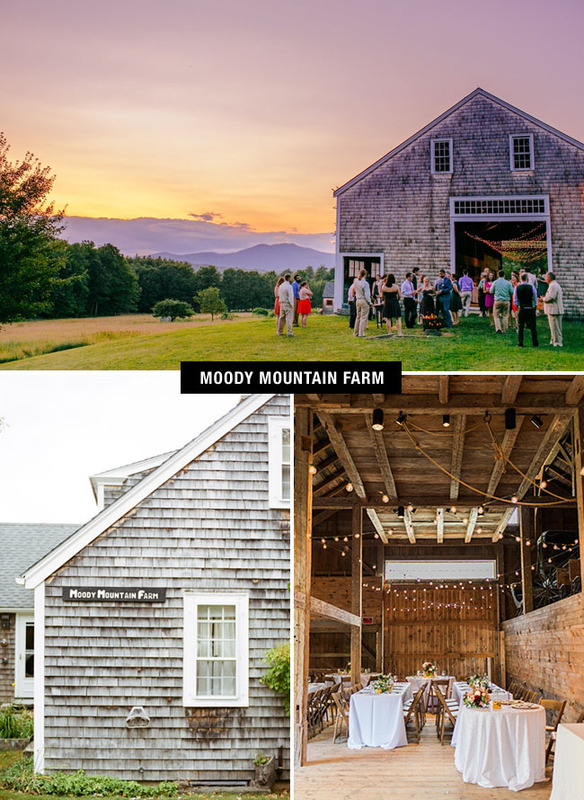 With its characteristic barn feel (srlsy, when we close our eyes and think ‘barn’ the picture that pops into our head looks an awful lot like Long Ridge Farm), this pretty venue features more luxurious amenities than one may assume. There’s a great room with fireplaces at both ends, a state of the art kitchen, two bathrooms and two upstairs furnished bedrooms (perfect for the bride + her ‘maids to get dressed). Aside from those essential stats, we adore its sweet Kentucky vibe and the fact that it can easily play backdrop to weddings of so many different styles. 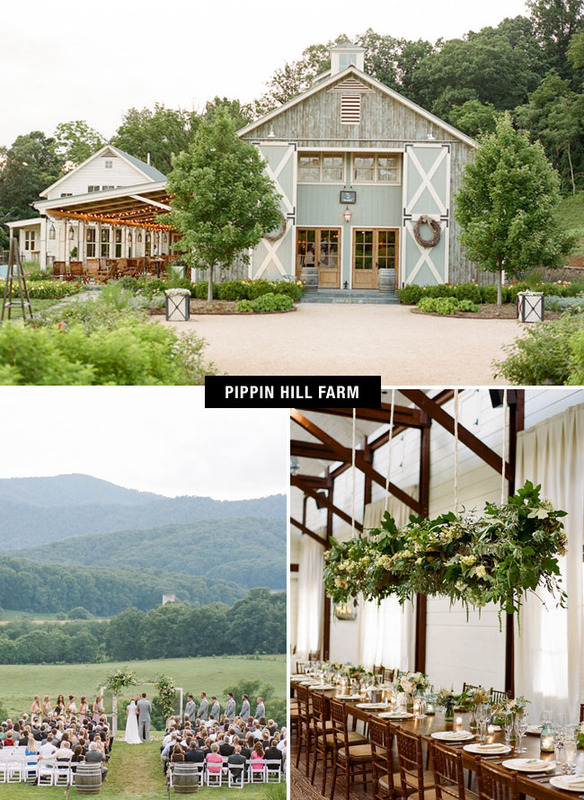 Guys, it doesn’t get much sweeter than Pippin Hill Farm. This custom-built winery wedding venue, designed to capture the essential elements of successful entertaining, is set in the beautiful Blue Ridge Mountain range – right outside of Charlottesville. Since it is a new build, the design of the barn-inspired structure draws upon historic agricultural architecture, yet is thoroughly modernized for executing seamless events. 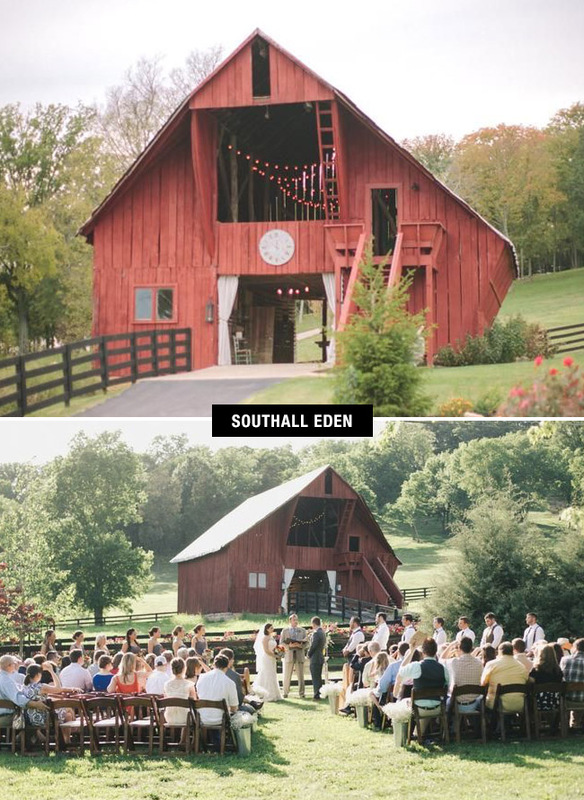 Located just 30 minutes from downtown Nashville, Southall Eden is a stunning, exclusive private farm hosting just a handful of weddings each year. The property’s unique + recognizable red barn makes for the perfect ceremony backdrop and it’s the perfect place for portraits and line dancing into the night! Need a little more incentive to book? The farm’s owner, Shannon O’Kelley, is a styling genius, too, and is available for hire to help bring your dream wedding to life! 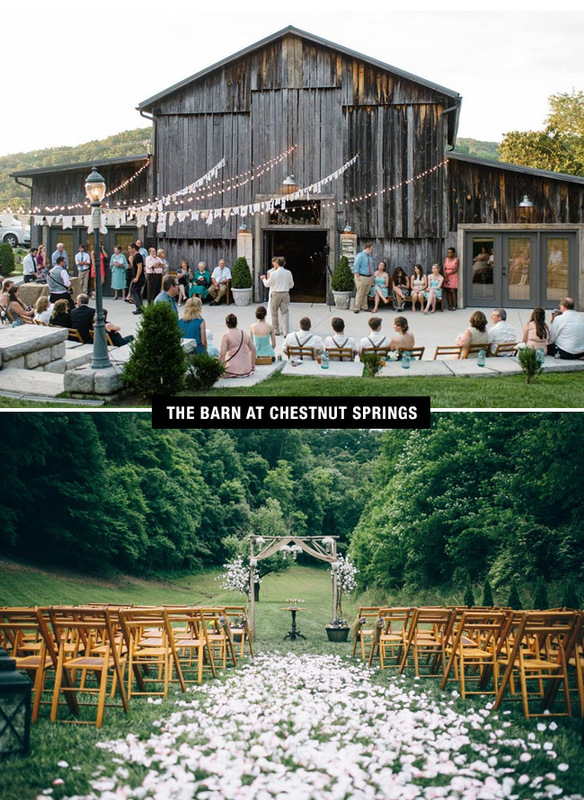 Situated just outside the Great Smoky Mountains National Park, The Barn at Chestnut Springs is an ideal countryside location to celebrate your big day. The classic + weathered gray wood barn has been beautifully restored to feature vaulted ceilings, exposed beams, elegant chandeliers and stylish wall sconces. Perfect for couples looking for history + charm in a modern day atmosphere. Bonus points: stunning views of the Great Smoky Mountains all around! Looking for an authentic barn setting in Tennessee? We’ve found it for you with The Barn at High Point Farms! The large rustic pole barn has been transformed into a magical wedding venue strewn with lights and draped with large white curtains. (Sign us up!) The vast property – already styled with bits of antiques and one-of-a-kind decor – is ready for your finishing touch to turn it into the space you’ve been dreaming of. 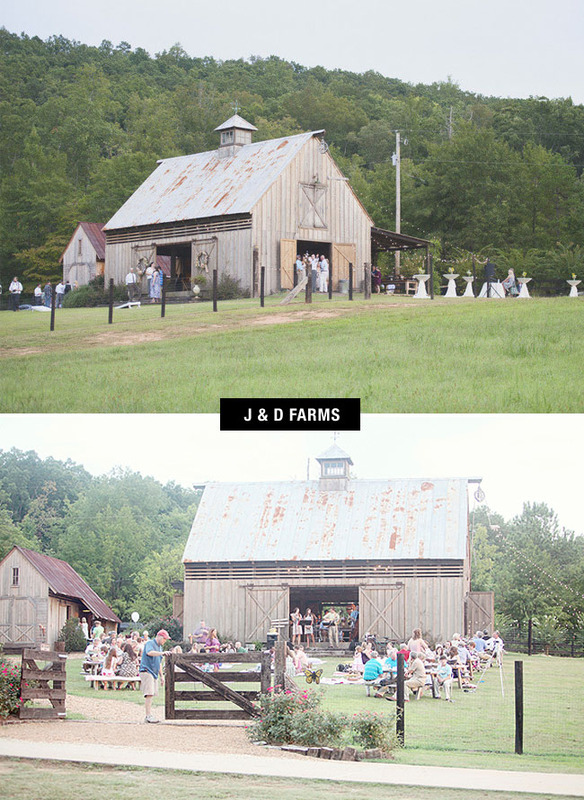 When we think of the quintessential southern barn wedding, a spot like J & D Farms comes to mind. A wedding at J & D means you are allowed access to the entire property – including the barn, the orchard, the gardens, pool terrace, carriage house backyard, and the carriage house itself! For a backdrop for celebration something as special as your wedding, we promise this Dutch-style barn, with its reclaimed plank flooring and charming tin roof, won’t disappoint! Dreaming of a southern barn wedding in Arkansas? Then check out The Barn at Twin Oaks Ranch in Dardanelle! Drape the classic barn entrance with beautiful textiles and light your reception with a stunning collection of chandeliers, or go for a more modern, classic, or rustic look. This barn is your canvas and a stunner of a blank slate that can be transformed so many different ways. We love it! We love the streamlined look of the barn at The Wheeler House, built in 2012 to complement the property’s existing historical home. The perfect place to make your own, enjoy the space + comforts of this new build – like its bridal suite AND wing for the groomsmen! 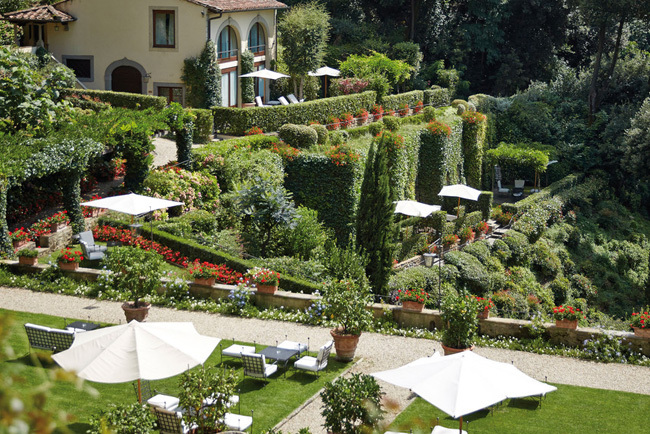 – but still feel the charm of this sweet Georgia property. 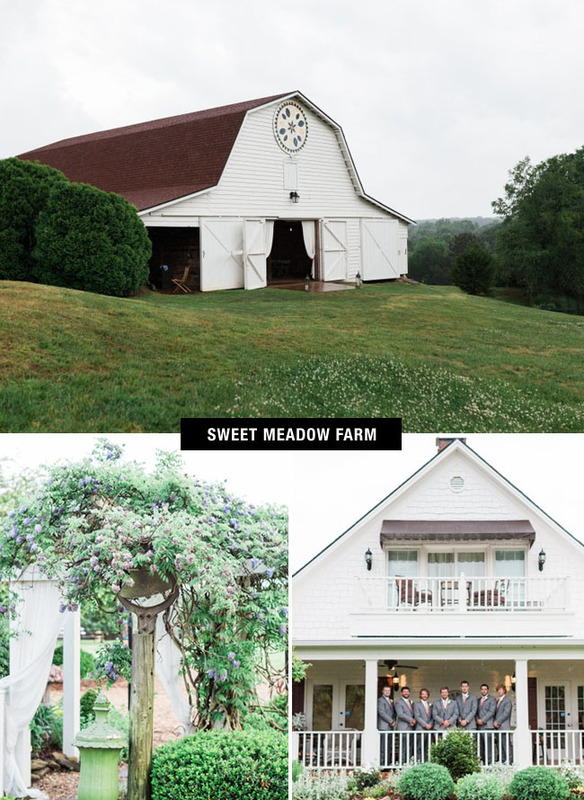 Last, but certainly not least, we have the barn at Sweet Meadow, conveniently located an hour outside of Atlanta. This working family farm is surrounded by pastoral farmland with stunning lake + mountain views. 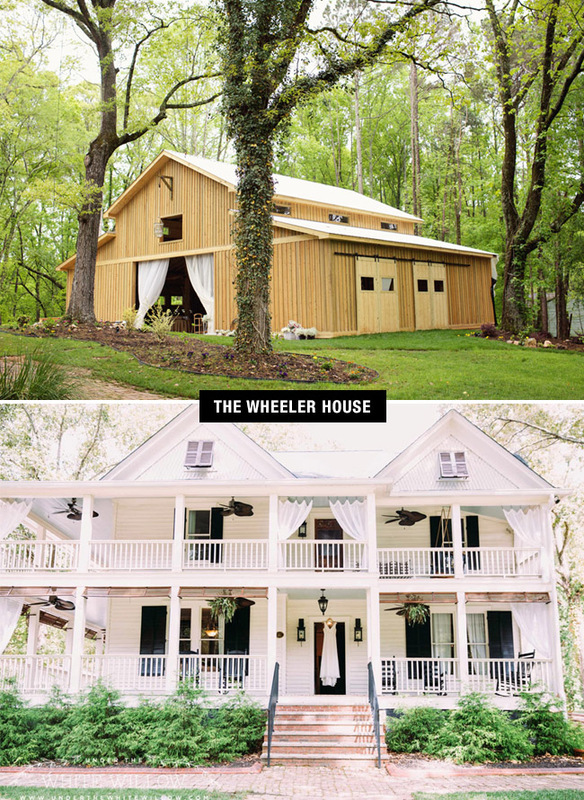 The turn-of-the-century barn couldn’t be more charming + would be the perfect place to celebrate your Georgia wedding! 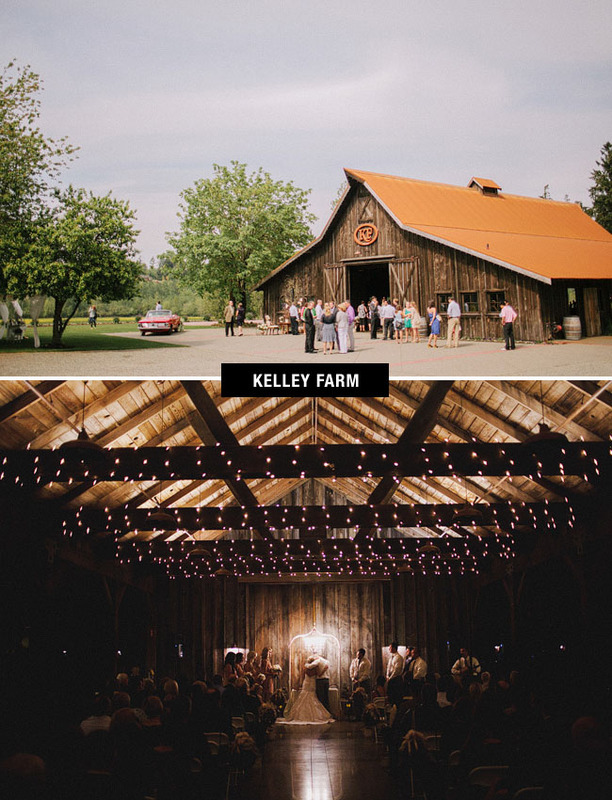 Was your favorite barn or wedding venue on our list? If not, be sure to share it with us in the comments! 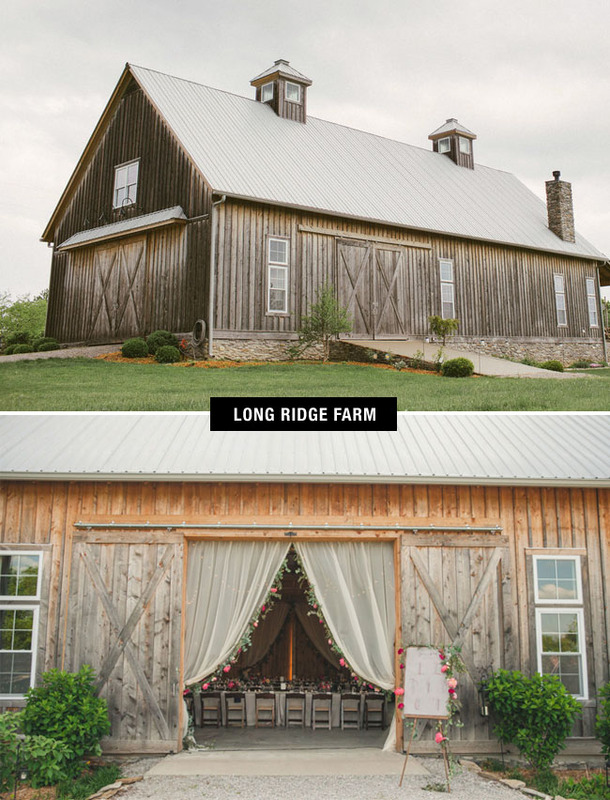 We hope our round up is helpful for you if you’re planning a barn wedding in the near future! And if you loved venue gawking, but a barn isn’t for you, check out our list of the Top 26 Coolest Wedding Venues in the US or find a location perfectly suited to your taste by taking a peek at the Venues in the GWS Wedding Artist Guide! Pippin Hill would be a dream to photograph at one day! Such a gorgeous venue! I love all of these! I would love to see Birch Hill Barn on this list next year! The Mayowood Stone Barn in Rochester, MN is unique, full of history and beautiful! This list is incredible and shows a number of styles of barns available. I love Evergreen Memorial Park with the stained glass windows contrasting the rustic barn. Vista west ranch just outside of Austin! Also Chandlier Grove just outside of Houston is really nice! I’m getting married at the barn at Hardy Farm in Fryeburg, ME this year and it is a DREAM! A chandelier inside the barn! love this list! But I think Dana Powers House in Nipomo should be on this list somewhere. Such a beautiful venue, with amazing backdrops and amenities! Red Barn Weddings & Events is a gorgeous new venue is Hokes Bluff, AL on the outskirts of Gadsden. It is overlooking a breathtaking view with uniquely designed bridge walkways. This venue should definitely be on the list! Isn’t it wonderful that so many of these old barns are being repurposed for such wonderful celebrations!! Maybe next year Swallow Creek Ranch in Cayucos, Ca (www.swallowcreekranch.com) and their seaside blue barn might make the list. The location is stunning. The Barn @ Locusts-on-Hudson in Staatsburg, NY is amazing! So excited for Sweet Meadow Events to be a part of this list. What fun to see beautiful authentic barns. Thank you so much. Congratulations to Sweet Meadow Farms! Our daughter was married there last May and it was wonderful! Gorgeous venue. So thrilled they made this list! Awesome list! I think one that might be missing is Sierra Vista in Virginia! Nothing quite like those views! Thanks for featuring one of my weddings! Long Ridge is a beautiful venue! Wow these are all lovely barns! This was such an incredible article to read, thank you!! I am working with Terra Promessa Farm in the Charlotte, North Carolina area. It is a rustic farm venue with a stunning barn and I know once they are open, it is going to stay booked! They aren’t opening for weddings until later this Spring, but I hope they make it on this list in the near future!! I think everyone who sees it will be as in love with the property as I am!! There are lots of lovely choices in southwestern Wisconsin as well. Check out the Bridle Barn and Gardens for a beautiful venue. Such beautiful barns! May we humbly add the Peach Shed Pavilion at Lenora’s Legacy Estate in Campobello, SC: http://lenoraslegacy.com/. The open air barn was used to store peaches back when our family estate was a working peach and cotton farm. Thanks! Would love to see The Still Farm in Downing, Wi. included on next years list! A beautiful White barn that offers many nooks around the grounds for vintage inspired photo’s. I definitely think that barns are beautiful places for a wedding. It gives the reception a rustic feel. It’s especially nice when you are able to find one that has beautiful trees around it. check out the barn at The Inn at West Settlement in Roxbury, NY. The organic cutting gardens surrounding the property are beautiful. No need for a florist. Check out The Rustic Barn at Prairie Gardens in southeastern wisconsin. http://www.therusticbarnvenue.com A one level barn that opens to a large covered patio and expansive lawn area for guests to enjoy all night. Nestled among farmers fields yet only minutes away from amenties. Look at The Red Wood Barn Armada A nice 1898 Cow barn to hold Service and another barn and yard for reception. Nice venue in south east Michigan. check it out on face book. Please check out our 80+ year old recently renovated dairy barn. We also have several buildings on the property were the couple’s each have their own dressing area, plus a cottage included for their wedding night. So many beautiful spaces! You should also check out the Celebration Farm in Iowa City, IA. The Double Round, Timber Frame and outdoor stone amphitheater are so unique and gorgeous! Nice pictures . Thanks foe sharing with us ,me and my friends was thinking of visiting to Montgomery in the next year,. I have no idea about The Venues in Alabama. Your information helpful to me finding the best . Please check out The Wedding Farm at Hammonds Creek Bend Farm in Wellington, Alabama. We have the only covered bridge in the county. What beautiful, gorgeous venues!! We would love a chance to add The Barn at Cedar Grove, in Greensburg, KY to this amazing list. Beautiful photos! Would love to see Flora Corner Farm in Mechanicsville Maryland on your list! I think the White Sparrow has to be my favourite barn venue, you should check it out! Incredible Information, Thanks for sharing it.I have to going Montgomery at the end of this month for select the best venue for my birthday party and i have no clue which Best Venue in Alabama are Best for the party .Your information will be suggest me choose best one. This is so amazing love the forth image the most. I would love a barn wedding! I really like the barn at Evergreen Memorial park. Are those stained glass windows or is that painted on the barn? All these venues look dreamy! I don’t know how I could ever pick one! While we did not make it into this list, we thank you for compiling the list and the beautiful pictures of the venues. Hopefully you will have a chance to check us out sometime! Bloom Lake Barn in Shafer, Minnesota is another spectacular barn to check out! Historic Hope Glen Farm in Cottage Grove, MN has a treehouse that is UNREAL. Please take a look at Walnut Way Farm in Shelbyville, Kentucky. A working horse farm with over 70 horses you will be surround by a classic elegant Kentucky experience. Each wedding is unique and the staff are personal and professional. Breathtaking views, indoor and outdoor options. WALNUT WAY FARM WEDDINGS in Shelbyville, Kentucky has been voted the Most Gorgeous Place to Get Married in Kentucky by PureWow.com, and the Best Place to Get Married In Kentucky by Frommers.com.